Laurie Cowin joined the Construction Dive team with a decade of experience in commercial and residential design and construction writing. She graduated from Ohio University with a B.S. in Journalism. She may be reached at lcowin@industrydive.com. Last year, Pennsylvania Governor Tom Wolf declared opioids a statewide disaster emergency, marking the first time the commonwealth declared a disaster emergency for a public health crisis. The declaration suspends regulations hindering addiction care access, which Wolf hopes will help streamline treatment for the 90 days the declaration is in effect. Seven other states have taken similar steps in declaring the opioid crisis a disaster emergency. Although the nationwide problem affects people across professions, construction industry workers are particularly prone to opioid addiction. 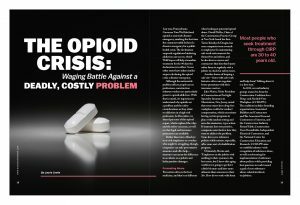 With that in mind, it’s important to understand why opioids are a problem and the safety considerations as they relate to addiction in a high-risk profession. 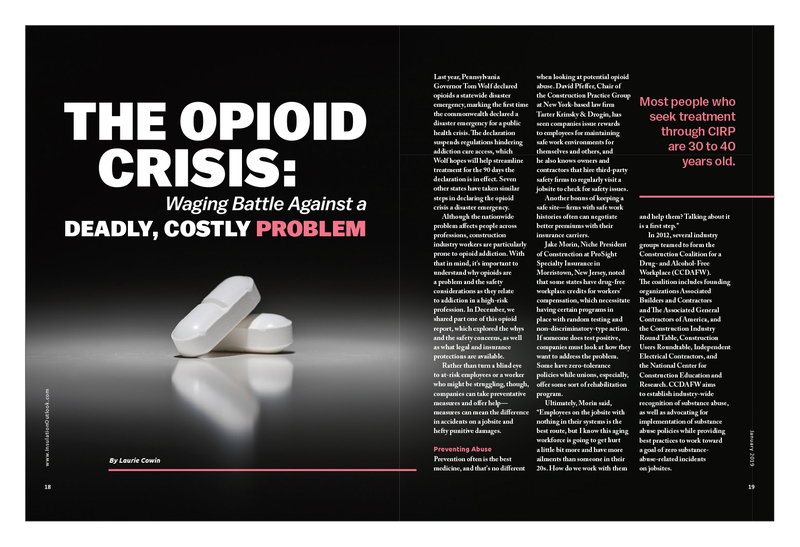 In December, we shared part one of this opioid report, which explored the whys and the safety concerns, as well as what legal and insurance protections are available. Rather than turn a blind eye to at-risk employees or a worker who might be struggling, though, companies can take preventative measures and offer help—measures can mean the difference in accidents on a jobsite and hefty punitive damages. Prevention often is the best medicine, and that’s no different when looking at potential opioid abuse. David Pfeffer, Chair of the Construction Practice Group at New York-based law firm Tarter Krinsky & Drogin, has seen companies issue rewards to employees for maintaining safe work environments for themselves and others, and he also knows owners and contractors that hire third-party safety firms to regularly visit a jobsite to check for safety issues. Another bonus of keeping a safe site—firms with safe work histories often can negotiate better premiums with their insurance carriers. Jake Morin, Niche President of Construction at ProSight Specialty Insurance in Morristown, New Jersey, noted that some states have drug-free workplace credits for workers’ compensation, which necessitate having certain programs in place with random testing and non-discriminatory-type action. If someone does test positive, companies must look at how they want to address the problem. Some have zero-tolerance policies while unions, especially, offer some sort of rehabilitation program. In 2012, several industry groups teamed to form the Construction Coalition for a Drug- and Alcohol-Free Workplace (CCDAFW). The coalition includes founding organizations Associated Builders and Contractors and The Associated General Contractors of America, and the Construction Industry Round Table, Construction Users Roundtable, Independent Electrical Contractors, and the National Center for Construction Education and Research. CCDAFW aims to establish industry-wide recognition of substance abuse, as well as advocating for implementation of substance abuse policies while providing best practices to work toward a goal of zero substance-abuse-related incidents on jobsites. The Occupational Safety and Health Administration (OSHA) has formal national standards for scaffolding and crane safety, but Morin thinks OSHA should also be involved in establishing national standards as they pertain to misuse of substances. Because companies work across state lines, the lawyer said, it’s important to have a federal standard in place rather than relying on state standards, which can vary. There are many treatment options available for opioid addicts. One specifically for laborers is from the British Columbia, Canada-based Construction Industry Rehabilitation Plan (CIRP), which was founded in the mid-1980s in response to the drug and alcohol crisis of the period. Although Executive Director Vicky Waldron wasn’t in Canada during that time, she said the construction industry in North America faces similar addiction issues today—mainly, a lack of resources. “People were looking for help or treatment, and there wasn’t anywhere to send them,” she said. That’s where CIRP came in. It began as a 12-step program, and Waldron evolved it to worldwide mental health industry standards so that today CIRP works within a harm-reduction framework. Services include individual counseling, as well as an outpatient day program, a residential program, a family program, and a telehealth program, which includes Skype, online support, telephone counseling, and text and instant messaging support. CIRP began collecting data after Waldron realized there wasn’t a lot of information for the industry from the industry. Its inaugural report last July showed that nearly 83% of those addicted to substances who come through CIRP’s doors screen positive for moderate to severe underlying mental health issues. More significant than that number, however, according to Waldron, is that most of those mental health problems are undiagnosed. About 90% of CIRP’s clients screen positive for a significant underlying early childhood trauma issue; about 70% of those also screen positive for moderate to severe post-traumatic stress disorder (PTSD). “We have people that are really presenting with severe mental health and addiction issues,” she said. Waldron has found employers and their staffs to be supportive of those who need help for substance abuse. “Nobody wants to lose a human life,” she said. Although there is some concern that providing resources might be perceived as endorsing use, she said that the opposite is true—it saves lives.